Climbing is rewarding, educational and fun! Rock and Rapid is the ideal setting for fun and exciting school trips or group visits. There is a huge variety of sessions available for young people aged six and upwards. Climbing is a great way to develop fitness, teamwork and communication skills in an enjoyable and exhilarating environment. Climbing is Tailored to Suit You! 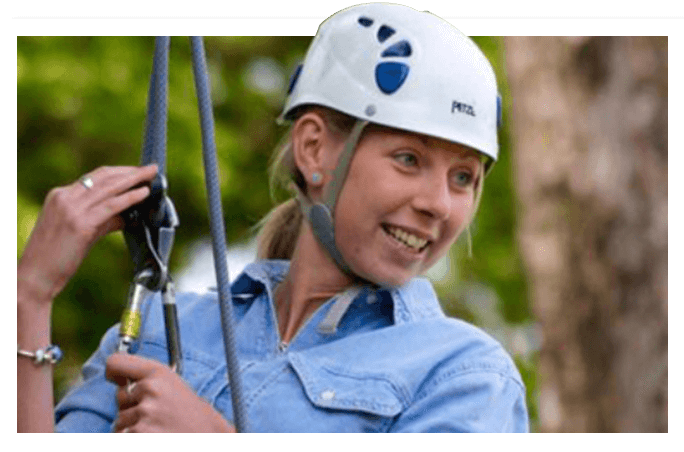 We are here to help you tailor activities to your needs, from a one-off climbing and abseiling session, to a structured program running over a series of weeks or months. Rock and Rapid can cater for GCSE and A Level syllabuses if required, and can supplement regular indoor sessions with outdoor trips in the summer months. Sessions can be run for groups as small as two up to as many as ninety climbers. Sessions are all fully supervised by qualified instructors, ensuring that each child receives the encouragement and attention they require. If you wish, your group can also work on NICAS, the nationally accredited scheme recognising achievement in indoor climbing. This scheme consists of five levels, ranging from learning the basics to becoming a competent lead climber. Rock and Rapid Adventures are the NICAS Primary Centre for North Devon. The instructing staff at Rock and Rapid Adventures are trained to work well with a wide range of groups including those with learning or behavioral difficulties, and those with a wide range of physical disabilities. The climbing centre holds an AALA license and is a member of the Association of British Climbing Walls. Staff are subject to enhanced CRB checks and hold First Aid Certificates. If you prefer, you can bring your own instructors to use the facilities at the centre, provided they hold appropriate qualifications and insurance. Guides, Scouts, Sports Club, Cubs, Brownies, Youth Clubs, Beavers, Young Farmers and Church Groups – these are just some of the groups that come and use us on a regular basis. We offer group sessions in the evenings and at weekends. We can cater for up to fifty people and have group rates depending on numbers. Qualified climbing instructors are welcome to bring their own groups to Rock and Rapid. All you need to do is bring in a copy of your qualification certificate (SPA /CWA or higher), your current First Aid certificate and the insurance document that covers your working with your group. If you wish, you can also do an induction with our NICAS Director that would allow you to deliver the NICAS scheme in the centre. The cost of this induction is £50.00 per head. This is reduced to £35.00 per head if you have a group of four or more instructors wishing to be inducted. You don’t need to book in advance to bring your own group to Rock and Rapid, although if you are planning to bring a very big group it is better to call ahead.